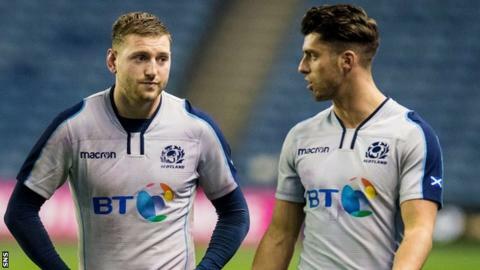 Scotland can cope without Finn Russell if he is ruled out of Saturday's Six Nations match against France, says forwards coach Danny Wilson. The fly-half, 26, was substituted after suffering a head injury in the first half of Racing 92's defeat by Toulouse on Sunday. He will now go through the graduated return-to-play protocols to determine if he is fit to play in Paris. "It's not down to one person," Wilson said. "We all know Finn is an outstanding rugby player. I've been really impressed with him, his attitude and his leadership in my short time with Scotland. "But I've also been very impressed with a lot of other players. If the likes of Finn or others are unavailable, it provides opportunities for other boys. "In the long term, there is something to gain from that in terms of international experience, Six Nations experience going into a World Cup year." Scotland have called up fly-half cover in the shape of Worcester Warriors' Duncan Weir, with Glasgow Warriors duo Peter Horne and Adam Hastings in the frame to start at the Stade de France should Russell be declared unfit. Head coach Gregor Townsend has also called Edinburgh trio Magnus Bradbury, Dougie Fife and James Johnstone into his squad, alongside Glasgow front rowers Zander Fagerson and George Turner. France go into the match having been humbled 44-8 by England at Twickenham in their last match. There have been reports of a player revolt against head coach Jacques Brunel, but Wilson dismissed the notion this French side are vulnerable. "The first half of the opening game against Wales they really showed what they are capable of," Wilson said. "Leading up to that game, there were performances we'd seen over the autumn that showed France can be a real danger, a real threat. They are a big, powerful side that can come alive and play a lot of rugby. "Maybe the away match in England wasn't as good a performance, but we also know what a bad performance can do to you the very next week, bouncing back at home. "We're fully aware of the challenge that's ahead of us. They'll be strong, a tough nut to crack, especially away from home. A great challenge for us and something we really look forward to."